Healthcare providers and plans need to implement open data sharing technologies to support transitions of care as patients move between plan types. 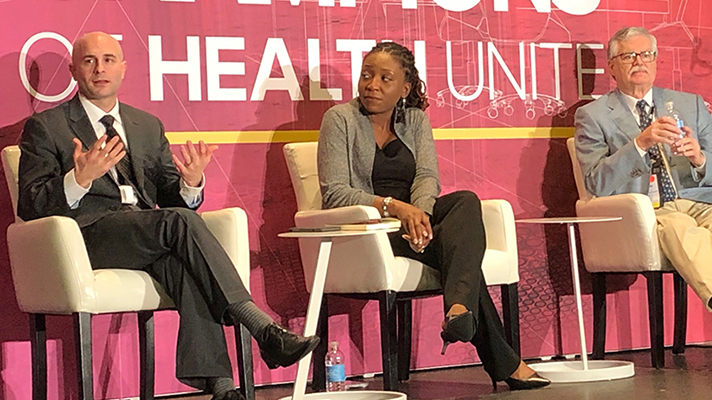 From left, Steven Posnack, executive director, ONC Office of Technology; Elise Sweeney Anthony, director, ONC Office of Policy; Dr. Terrence O'Malley of Partners HealthCare, a member of ONC's Health Information Technology Advisory Committee. "Having just read over the rule and looked at the summary sheets, what you see is it's a very thoughtful set of expectations,” said Dr. John Halamka, CIO of Beth Israel Deaconess Medical Center. “We know that information blocking is often a misalignment of incentives, so it actually does allow us to consider things like cost and difficulty and burden. In effect, what it does is to remove arbitrary blocking and gives us a guideline (to move forward). And that's really a great approach." So far, the money for IT implementation has gone to the top spenders such as hospitals and ambulatory care, according to Dr. Terrence O'Malley of the Partners Healthcare System. The less expensive care settings, such as home health, have gotten virtually nothing. CMS’ proposed changes to the healthcare delivery system support the MyHealthEData initiative and follow regulations released by CMS in 2018 finalizing regulations that use potential payment reductions for hospitals and clinicians to encourage providers to improve patient access to their electronic health information.